As you can see here - my journal is filling up nicely - I love all the juxtaposed pages and bits and bobs sticking out every which way! Today, I thought I would give you a little insight to my thought process on my journal pages by showing pages before I wrote on them. Keep in mind this is all new to me - only week 5 I think of journaling, so if things seem obvious and/or crazy - sorry! Most of the time when I start a page I have no idea what I am going to write about, but as the page comes together, I figure it out or if I can't make it work for something specific, I will keep it for a page when I need to journal and have nothing ready to use. These 4 pages 2 pieces of paper - that I gesso-ed and painted with colors that I am drawn to so they would have some nice background. I do not always do this, sometimes I just start journaling on a bare page. I let these dry overnight and then started working with them. Even though my journal is vertical, I decided to make these pages all horizontal. 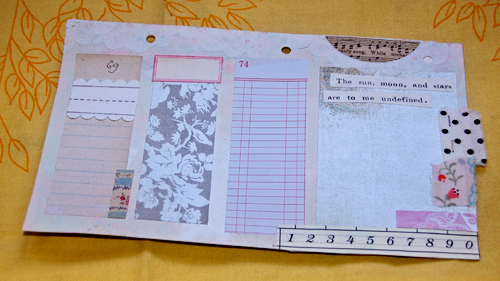 The first page I did was inspired by a scrapbook page I had seen somewhere with blocks of different papers lined up- and I decided I wanted to use it to have lists of things - there were several ideas of what types of lists in my head while I was making it so it should be fun to see what I end up going with. Just to give you an idea of supplies that I use. 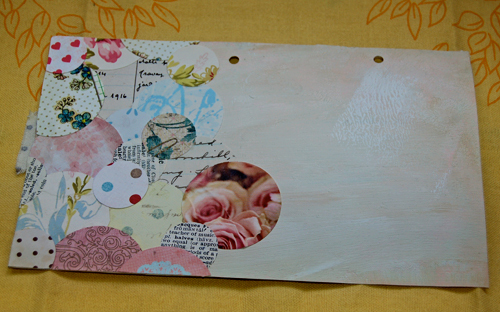 I do use scrapbook papers in my pages (or as the actual page itself) - but I have so many scraps it is hard to say whose they are. But in this page I do have a few things from Jenni Bowlin (and she is just as great as her products! 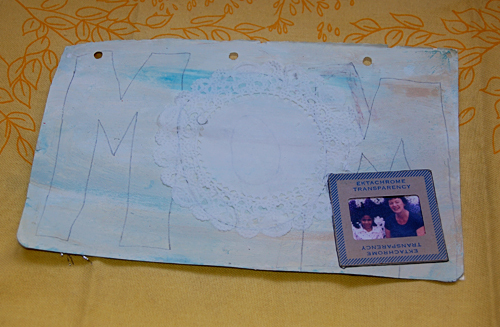 ), some fabric snips, vintage sheet music, vintage ledger, part of a pretty soap wrapper, text from an old book and a piece of a greeting card. Next, I added circles to a page. I have no idea what I will do with it, but once i started I could not stop! And lastly, I started a page with a photo of me and my mom years ago (at disney world) that I just stumbled upon and fell in love with, to write about my relationship with her and how strong it is growing and how much I love that. I am interested to see how this page turns out since it is so plain and ugly at the moment. So - next up will be the pages once they are done with my weekly check in that I do with Kari. Hope, this is fantastic! I love hearing about your process and how you're getting to the finished pages that I'm seeing at our check-in each week. Fabulous! Love this to pieces. I am so inspired everytime I see your amazing journals. Thank you for sharing some peeks! 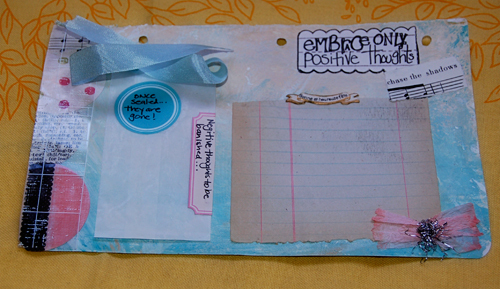 I'm so glad you shared these, they are very inspiring, can't wait to see them filled up. I bet the "Mom" one will end up the best yet! I love the idea of the circles you did on the page. A beautiful idea. Hope this is really incredible. 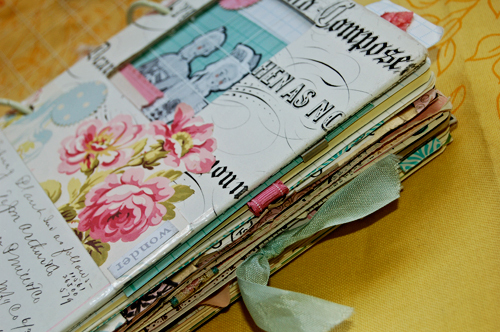 How about doing a workshop on makinga journal at Accessories of Old?